Make up your mind — you have stories to tell. 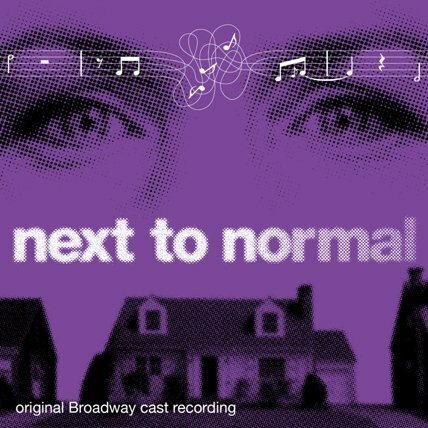 Next to Normal is one of my favorite contemporary musicals. 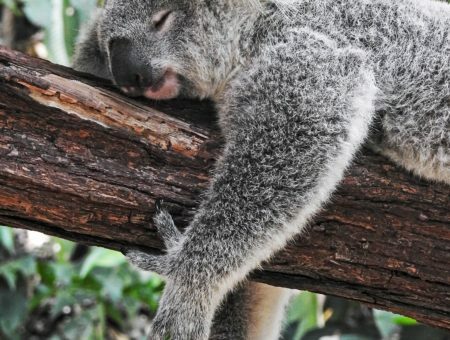 I’ve wanted to write an article about it for a long time, so I’m beyond excited to feature it today. Next to Normal, with music by Tom Kitt and book and lyrics by Brian Yorkey, is about Diana Goodman, a woman struggling with bipolar disorder. As Diana’s condition worsens, her family struggles to help her and to deal with their own feelings. The music of Next to Normal is powerful, ranging from soaring rock songs with full harmonies such as “Make Up Your Mind/Catch Me I’m Falling,” to conversational moments such as “Hey,” to quiet, intense ballads such as “There’s a World.” The music lets us into the emotional lives of these characters: Diana, her husband Dan, their son Gabe and daughter Natalie, and Natalie’s kind-of boyfriend Henry. 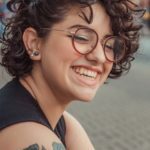 The mental health of college students is a hot topic right now, and many college students suffer from mental illnesses such as anxiety and depression. When I feel anxious, my clothes can have a big impact on my mindset. A bad day can be worsened by wearing clothes that don’t make me feel good about my body, or bettered by wearing clothes that make me feel comfortable and confident. 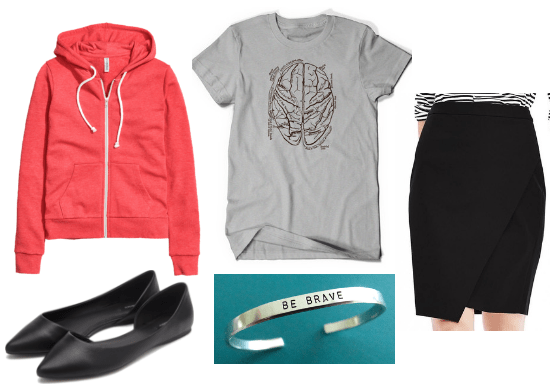 Using three characters from Next to Normal as inspiration, I’ve created outfits that use three different strategies for how to dress when you’re not feeling your best. Keep reading to see them all! I am the ones who’s always been there. This outfit, inspired by Dan’s business-professional look, uses a strategy I learned from a friend: “Dress your best when you feel your worst.” Dan sees himself as steady and dependable, so stick to tried-and-true neutrals. 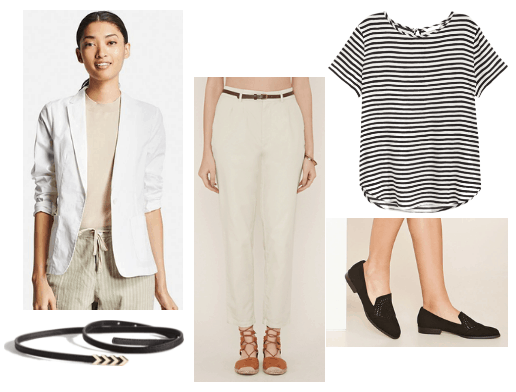 Put on high-waisted khakis, a black and white striped shirt, and a crisp white blazer. Accessorize with a slim black belt and faux suede black loafers. And everything else goes away. Natalie is perhaps the character that we as students can relate to the most. In addition to dealing with her family, she’s applying to colleges and figuring out who she is. The strategy for this outfit is to put on a casual, comfortable piece and pile on accessories to take it to the next level. Look like a “vision in blue,” as Henry calls Natalie, in this ribbed midi dress. 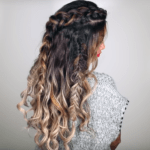 Add clear plastic sandals that allude to her status as “the Invisible Girl” and a stack of silver bracelets made from piano wire that represent her musical talent. 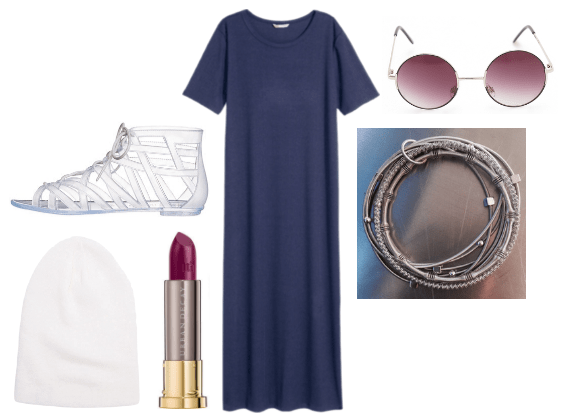 Finish the look with a white beanie, round sunglasses, and red-purple lipstick. This Diana-inspired outfit mixes professional and casual. Since so much of the musical focuses on Diana’s brain, tuck a t-shirt printed with an anatomical brain into a classic black pencil skirt. Add pointed black flats and a bright pink sweatshirt. And, for the days when you need it, finish the look with a bracelet that reminds you to be brave. Next to Normal deals with the difficult subjects of loss, grief, and illness in a beautiful way. 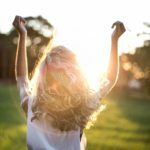 Although it doesn’t give us any easy solutions to these problems, it can be comforting to know that other people face these problems, too. Have you seen a production of Next to Normal? What clothes make you feel comfortable and confident? Are there any plays or musicals you would love to see covered in this column? Let us know what you think in the comments below!